You guys are well aware by now of my deep, unwavering love for all things avocado. And you’re probably also aware of the fact that when it comes to avocados, guacamole tops my list. I mean, I could consume guacamole in some form for pretty much every meal. But I realized recently that I don’t seem to see it quite as often on menus during the wintertime, and I don’t eat it as much at home this time of year either. And while I get it (the winter months aren’t exactly prime avocado season), I don’t think the goodness of guacamole should be forgotten during the colder months. So I decided to whip together a winter-inspired guacamole that I could start eating on the cold weather regular. It also had to be something I could quickly prepare and serve to my family on Christmas and to friends for the New Year when things are hectic. Oh, and for game day parties too. 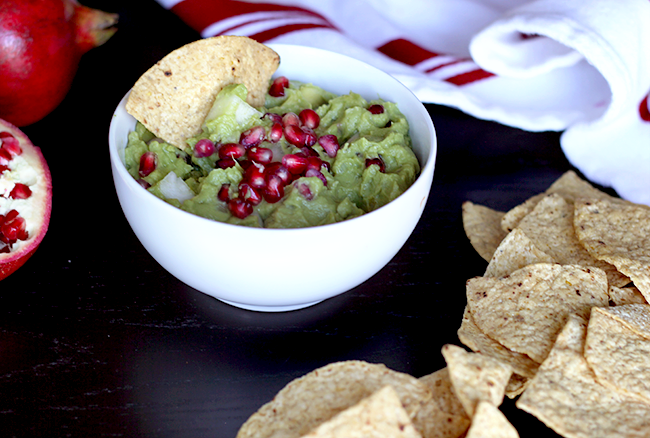 Basically, I needed a more wintery version of guac to become my go-to for this time of year, and it had to be simple and fast. So I played around with some different wintery food additions, and what I came up with was so delicious that I just had to share. Peel and cube the pear, and set aside. Remove seeds from the pomegranate, and set aside. (To seed a pomegranate, score the fruit lightly, pull apart into halves, submerge in water, push down edges, and hit back of each half with a spoon, allowing the seeds to fall into the water. It’s actually really easy.) 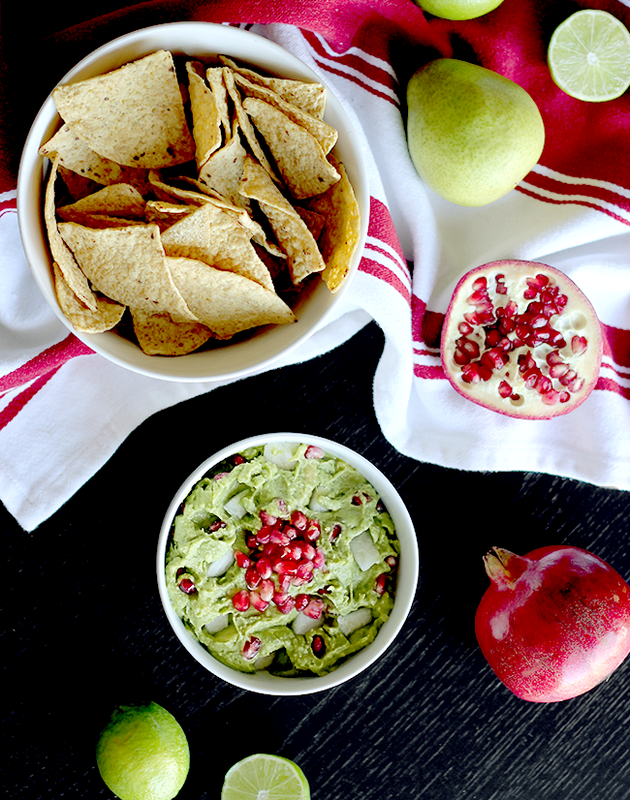 Combine the pear and pomegranate with Wholly Guacamole Classic Dip in a serving bowl. 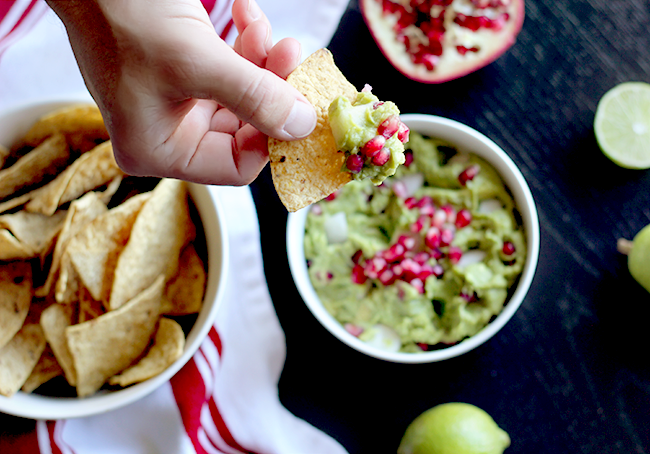 Squeeze half a lime over the top, add a little salt, top with a few pomegranate seeds, and serve! It’s super easy and so yummy. 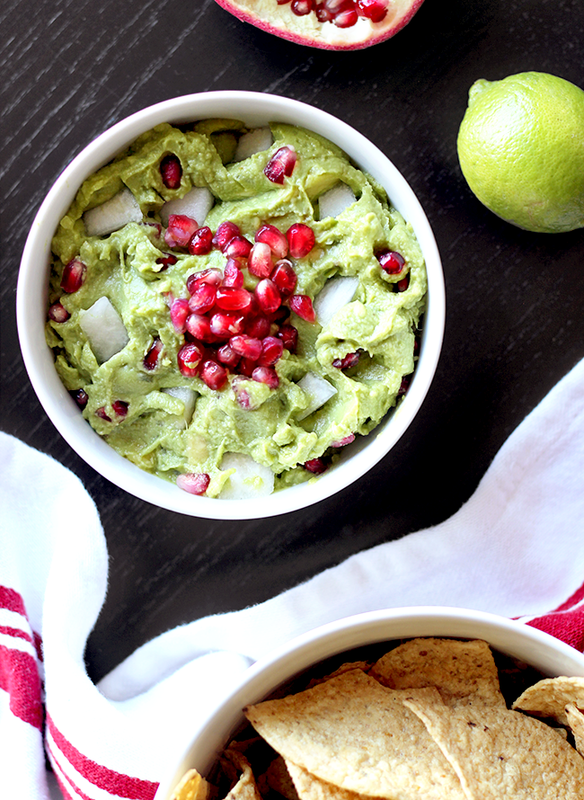 This guacamole looks really pretty and so festive, but it tastes incredible too. The pear gives it a subtle sweetness and great texture, and the pomegranate seeds give it a wonderful tartness. I like to eat it with tortilla chips, but it’s great with crackers too. 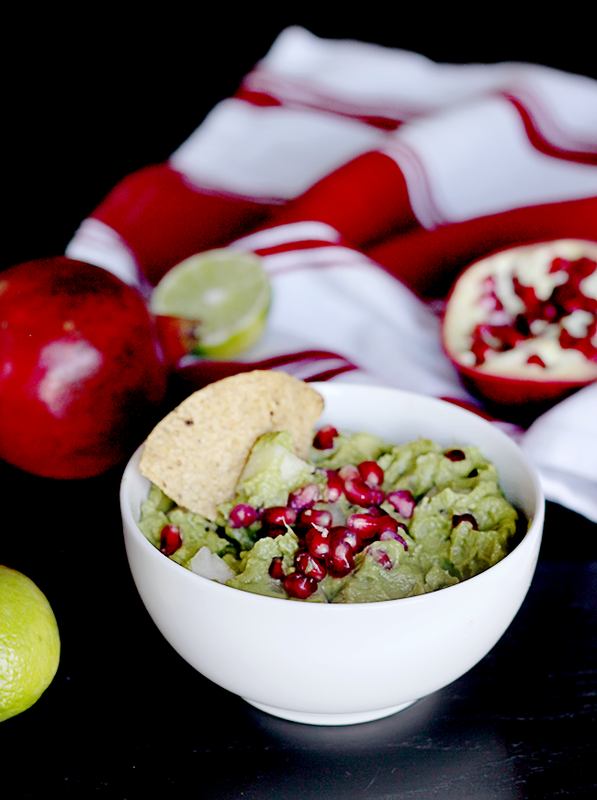 And despite the fact that avocados can be slim pickings this time of year, this guac is incredibly fresh tasting – thanks to the Wholly Guacamole. You guys have heard me sing their praises before, when I used their Classic Dip for a summertime watermelon feta guac dip, or when I made a guacamole pizza back in January. 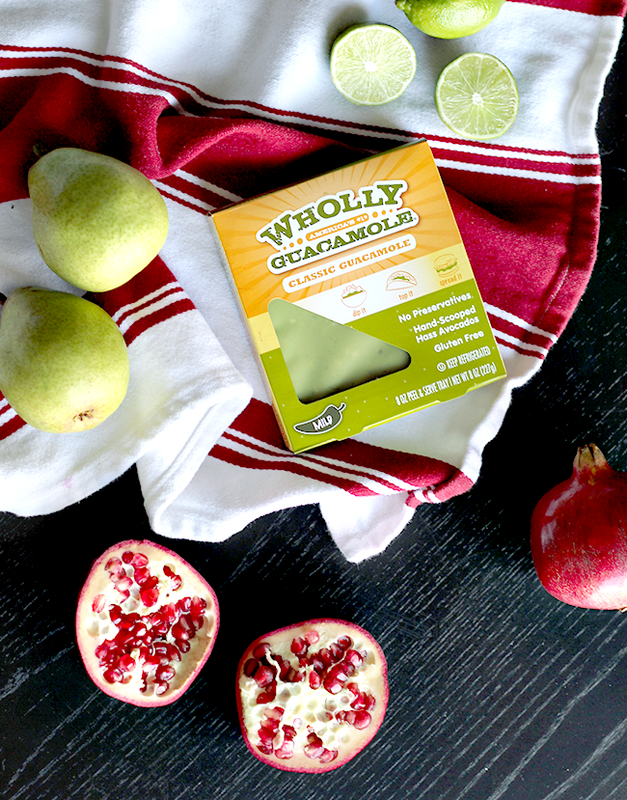 Their guacs are super fresh, gluten free, preservative free, and kosher, and are made with hand-scooped Hass Avocados. They are genuinely delicious, and as good as (maybe even better than) homemade. They are our favorite, whether we enjoy them right out of the package or fancy them up in different recipes. The Classic Dip is amazing, as is the Spicy. I’m a big fan. Win a YEAR of Pet-Themed Jewelry! I think my favorite Christmas of all time was when Essley was about to turn one (her birthday is three days after Christmas), and Robbie’s parents came here to Chicago from Arizona to celebrate with us. It was the first (and so far, only) time that all of the grandparents were here for the holidays, and we were all together, and everything just felt right. Real life doesn’t always allow for those storybook holidays though, and it’s just not logistically possible to repeat that magical Christmas every year. But that doesn’t stop us from doing everything we can to make it feel like we’re together. Today I thought I’d share some of the ways we stay connected as a family when we can’t be together for Christmas, in hopes it can help those of you in similar situations. 1. Phone carol. It sounds cheesy, and maybe it is, but we love it. 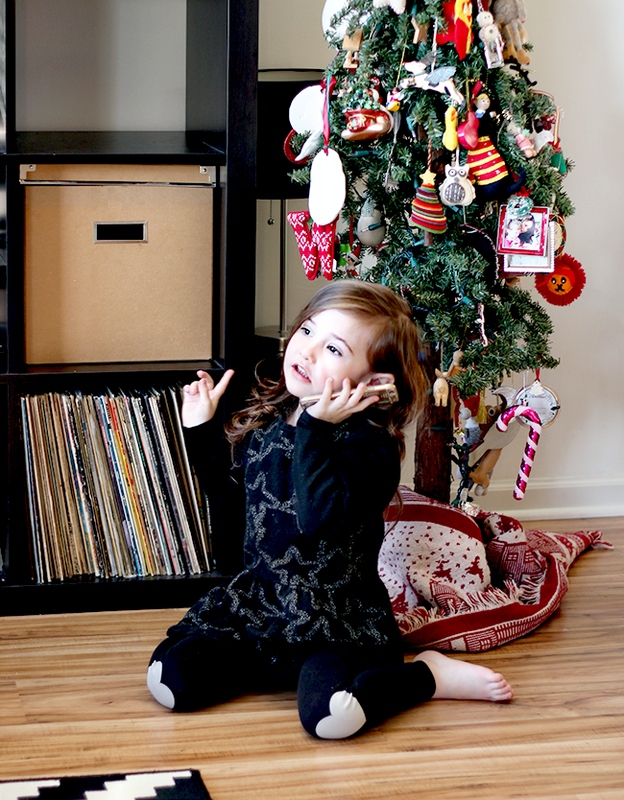 Elf said it best: “The best way to spread Christmas cheer is singing loud for all to hear.” Essley is all about the Christmas carols, and if she can’t be right in front of her grandparents to perform, singing over the phone is the next best option. Sometimes we even all chime in. It makes us feel like we’re together, even if just for a few minutes. We do it often and unapologetically throughout the season. 2. Videophone on Christmas Day. Videophone! It’s the future! (Who else remembers being a kid and dreaming of being able to see people in real time when you called them? It was right up there with flying cars, man.) Seriously though, FaceTime and Skype make being apart infinitely easier all year round, but they really make a difference on holidays. We FaceTime with the grandparents multiple times while unwrapping gifts, eating Christmas breakfast, playing with the gifts, etc. All day. It’s the next best thing to actually being together. 3. Make meaningful, personal gifts to send. 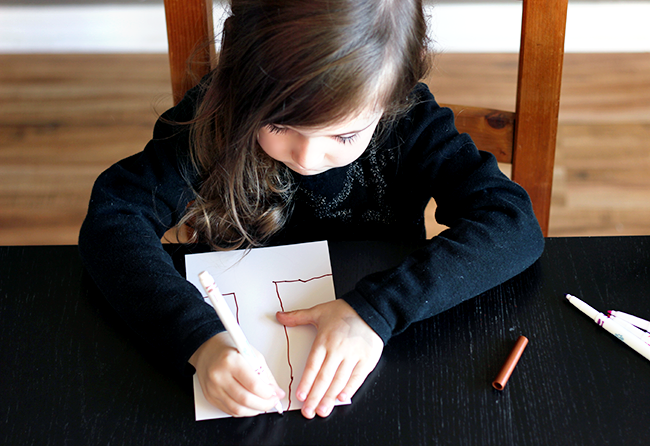 Every single year, Essley has sat down and worked for hours on special drawings to give to her grandparents. 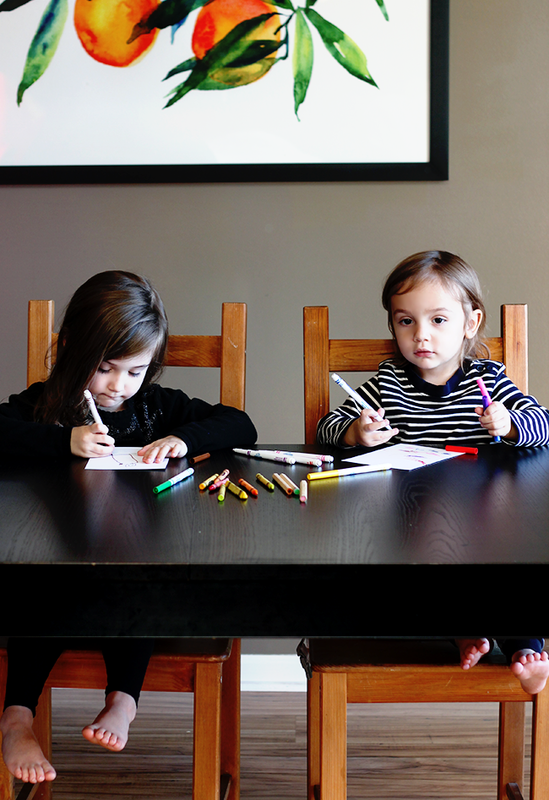 We never go Pinterest-crazy with these gifts – she likes to do good old fashioned crayon and marker drawings on paper. She puts so much time and energy and love into them. It’s really special, guys. Then we frame them and wrap them up together. It’s so much better than giving them a store bought gift, and truly a way to send a piece of herself when she can’t actually be with them. And this year, Emmett is old enough that he was able to get in on the action too! 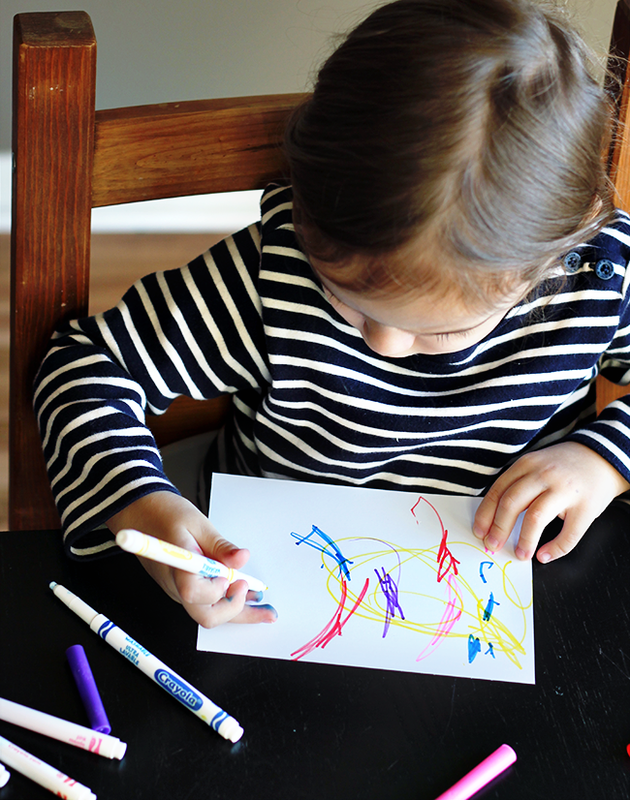 He loves drawing and coloring more than any other activity (for real), and I can’t wait to hear what Robbie’s parents think about his masterpiece. 4. Make plans to be together in the new year. When we can’t be with the grandparents for Christmas, we always make plans during the holidays for a future visit. This year, Robbie’s mom is coming here to stay with the kids while I meet Robbie in Denver for the band’s New Years shows, and we’re also making plans now to go visit both of his parents in the spring. It’s a great way to get past the sad parts of not being able to be physically together during the holiday season, and to also have something special to look forward to as a family. 5. Send your gifts with expert care. We’ve had our fair share of gifts get damaged in the shipping process, and the disappointment can be pretty intense when in an effort to stay connected with loved ones for the holidays you send something special only to learn it didn’t make it in one piece. 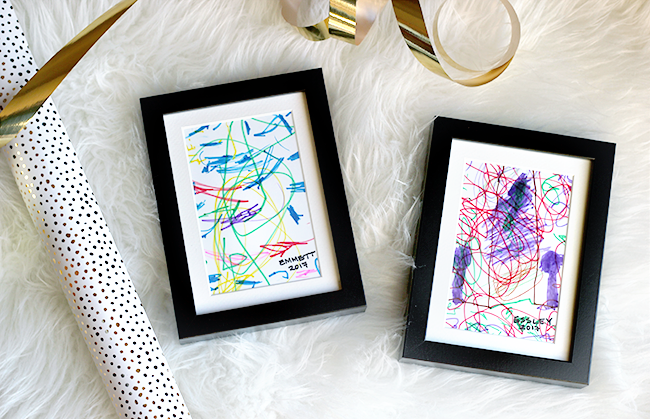 Since we frame the kids’ artwork in glass frames, this is especially important. 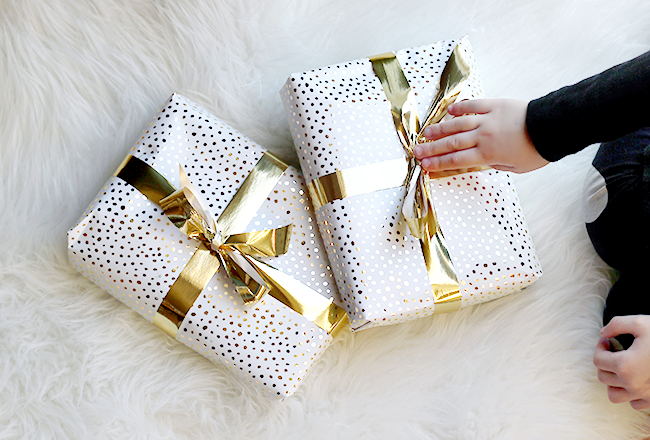 We take our wrapped gifts, head over to The UPS Store, and let the professionals handle the logistics of packing and shipping our holiday gifts to the grandparents. 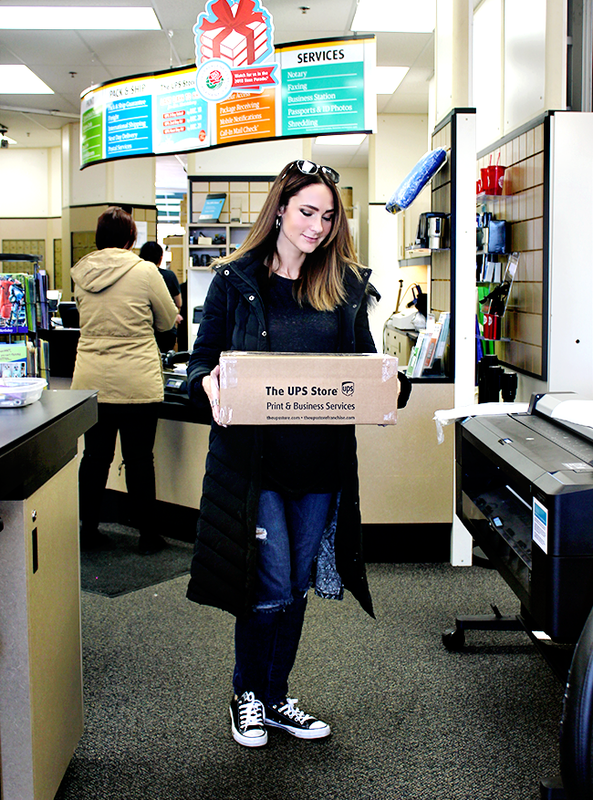 It gives us peace of mind to know The UPS Store backs its services with the Pack & Ship Guarantee – if an item is somehow lost or damaged, The UPS Store reimburses the customer the cost of packaging materials and service, as well as shipping costs. 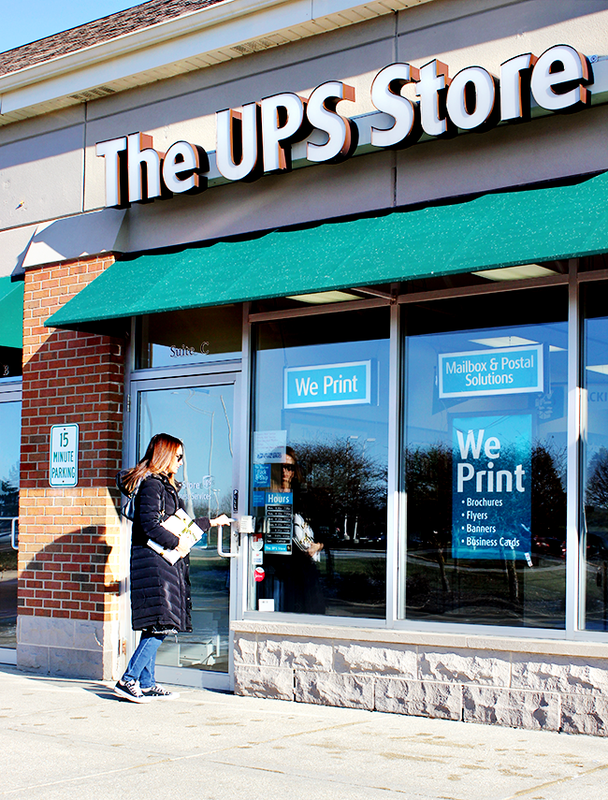 The Guarantee applies to items packed by The UPS Store and shipped via UPS®, DHL® or USPS®. Knowing our gifts will arrive to the grandparents safe and sound is just one more way for us to feel a little closer when we can’t actually be together, and I’m grateful for that. (Bonus: Taking our gifts to The UPS Store to be packed and shipped also saves me time and alleviate stress during an insanely hectic time of year. Just saying.) Oh, and here is one more awesome thing about visiting The UPS Store during the holiday season. Through December 31st, participating The UPS Store locations will support the Toys for Tots Literacy Program with an in-center donation card drive. Every donation helps purchase books for local children in need. Pretty great, right? And, for the second year in a row, The UPS Store is hosting the 5 Days of Giftmas, an interactive guessing game where customers have a chance to win prizes. There will be one Facebook Live game each day December 11th-15th (so its not too late!) at 2 PM ET. 2) If you follow The UPS Store on Instagram, you’ll notice a similar game where customers can “Guess the Gift” for a chance at a cool prize. The game series started back on December 4th, but is continuing until approximately three weeks after, with a new box every Monday and Wednesday. Woohoo! For those of you who are away from loved ones during the holidays, I’d love to hear ways you stay connected!